Discussion in 'Diablo 3 General Discussion' started by Nizaris, Oct 17, 2012. 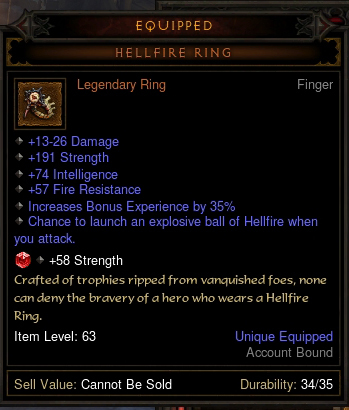 I just wanted to make a thread where people can show off the rings they've farmed from the Infernal Machine (http://www.diablowiki.net/Infernal_Machine#The_Hellfire_Ring) event. Well, that happened a lot faster than I thought it would. I owe it all to kestegs' invitation and patience. Not the greatest, but it's a start, right? It's also very hilarious watching Leap proc the fireball and then having it greet me at the landing spot. Worked hard for my Keys, enjoyed myself. Myself and 3 other 30-60ish PL folks tried the bosses. It was very, very difficult - our only melee was kind of weak. And, to be honest, I don't care. It was a freakin blast. We died a few dozen times. Shades of new WoW content when serious guilds were trying new stuff, wasting resources knowing the rewards probably weren't worth the time. Anyway, mp4, we downed em all, and nary a thing. Such is life. 3 hours gone. And it didn't matter, it was absolutely the most fun 3 hours I've had in the game since the first 3 of release. Here's to me wiping again this weekend when I get more keys and more time. Congrats to you that have your Rings! Got lucky I think. Just 4 uber runs and got 223 dex and 3.5 crit. Run seems to be easier with more players. Pretty good one, congrats! Looking forward to seeing more pics here. And congrats gakky, very nice roll! We did ubers on p7, it was pretty tough. I think I was actually the only one to die though. Sk/magda was the most difficult, then khulle/siege. I think with changing a few things I can not die much next time. I'd also highly recommend doing it with at least 3 people, made a big difference. You know what you have to do next? Roll a better ring tomorrow. Worked hard for my Keys, enjoyed myself. It was very, very difficult - our only melee was kind of weak. And, to be honest, I don't care. It was a freakin blast. We died a few dozen times. 3 hours gone. And it didn't matter, it was absolutely the most fun 3 hours I've had in the game since the first 3 of release. Here's to me wiping again this weekend when I get more keys and more time. So good to see posts like this. I personally am having a blast with 05. I ran into 3 simultaneous boss packs in Leoric's hunting grounds last night. EPIC battle for me on MP2 (only died once when I initially found them). I know, kestegs! Hahaha, it was crazy seeing them drop like that. I was willing them to drop for you all, too. But like I said, I owe you machines, so whenever you wanna run it again, you let me know and it'll happen. Nice ring, Gakky! Well done. PCS, you better believe it! The crappier of the two will just go to the merc, lol. Funny thing though is that the ring is a DPS upgrade over what it replaced, so it was still a good roll for me in that sense. Nice to think it can get even better. I agree, while I liked the last patch the game hasn't been much of a challenge since 1.0.3, glad to hear others are enjoying it as well! Did 9 or 10 runs in A4 trying to get the stupid plan last night.. No dice. Maybe another 50 and I should get that sucker! Those are the first two I made. Nothing special but I'm wearing the second and gave my follower the first. I'll keep trying! Just to be sure - I don't really want to make a new thread about it - the encounters reset if you fail(all players dead), right? My current gear is roughly like this(a little bit better, if it hasn't updated) http://eu.battle.net/d3/en/profile/Cpdoom-2926/hero/68754 my total all res is 850ish and I have 1800ish LPS. Reckon I can kill them on MP4, or even higher? Edit: I am asking because I'll soon be on the verge of doing the Ã¼bers. I just need two keys more then I am set. They reset if you die in such a way that you can do it again and the bosses have full health. Almost 100% sure of that! Agree there. We did MP5. I can imagine MP7 would be tough! It was tough with 2 players, but strangely easy with 4 even though 2 guys were weak random players. Probably because the hardest part is the control effects. We encountered a bug one time with Magda. We killed all her minions but she kept her shield up We had to die and redo to complete. After getting my ring I went and got the machine plan which dropped first time too A bit backward getting the ring before the machine lol. And my first warden kill was nice - 2 browns - a key and a good vile ward. 1. Get 3 or 4 players. More is better. 3 or 4 is much much easier than 1 or 2. Also you all get the drop so the machine becomes more cost effective. 2. If you have organs already try to wait until you have 3 machines. If you get the arena for the organ you already have then complete it, and then in the same game use another machine. This will be guaranteed to be one of the other areas. This way you have a partial control over which arena you get. 3. Get lots of defense and life on hit or life steal. 4. For parties you need 2 tanks, one for each boss. 5. Dual wielders - it's worth switching to a shield for this. - but don't drop life steal or LOH for this, and only if it's a shield with good mitigation. This will allow higher MP. 5. Dual wielders - it's worth switching to a shield for this. Are you absolutely certain this is good advice? In some cases this would halve the character's life on hit and much more than halve the character's life steal (through loss of up to 3% LS and lots of dps). I can't really debate the point; I have my machines but am waiting on my pals to get theirs before giving the ubers a shot, so I haven't tried. But switching to a shield would make me have to revert to life on hit from life steal and lose ~15k dps. I kinda doubt you can solo it, I'll agree with the others to get some friends to help. They respawn just like any boss fight. Just make sure you have enough time left on your stacks. We had that happen too actually, I think at around 50% life. We killed SK, cleaned up all the trash and she unshielded a few seconds later. I'll also probably disagree on the shield. A monk or Barb get so much of their sustainability from dual wielding. It's worth the ehp loss to get loh/ls/attack speed/DPS. Actually on mine it would nearly make life "regen" 1/4th per same time unit attacking. (half life on hit, lower LS, slower attack speed & less spirit regen for LPSS). oh no no no. See (3) above that. Don't drop your weapon if you lose LOH or LS. Sorry I should have qualified that. Most people only have those stats on one weapon, and the other for damage. You will lose 15% AS but that's pretty small especially if you have AS on items. The point is just to get your mitigation up with a shield. It's not worth it if you don't have a good shield of course. Don't worry about your loss in damage. If you already have no problems with the difficulty then a shield won't help much, unless you want to do higher MP for a better chance at an organ. Shield vs DW is a very contentious issue. Generally DW is far superior. 1.05 has narrowed the gap a bit. Decision is going to depend a lot on your equipment and what shield you can get.